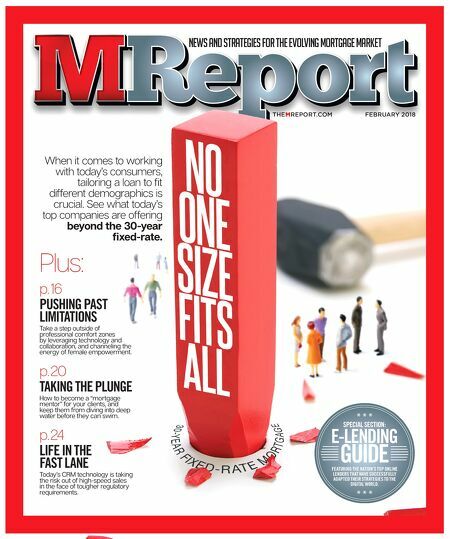 news and strategies for the evolving mortgage market FEBRUARY 2018 THEMREPORT.COM Plus: p. 16 PUSHING PAST LIMITATIONS Take a step outside of professional comfort zones by leveraging technology and collaboration, and channeling the energy of female empowerment. p. 20 TAKING THE PLUNGE How to become a "mortgage mentor" for your clients, and keep them from diving into deep water before they can swim. p. 24 LIFE IN THE FAST LANE Today's CRM technology is taking the risk out of high-speed sales in the face of tougher regulatory requirements. When it comes to working with today's consumers, tailoring a loan to fit different demographics is crucial. See what today's top companies are offering beyond the 30-year fixed-rate. SPECIAL SECTION: E-LENDING GUIDE FEATURING THE NATION'S TOP ONLINE LENDERS THAT HAVE SUCCESSFULLY ADAPTED THEIR STRATEGIES TO THE DIGITAL WORLD.